The latest Ponemon Institute research reveals that businesses' data assets are being put at risk as a result of IT Security departments incorrectly estimating the value of business data. The research, surveying 2,827 professionals in the US and UK, reveals businesses' insufficient investment into the availability, protection and security of their data. Be the first to get your hands on this eye-opening business research - don’t miss out. If you missed the Ponemon research launch, click below to watch the recording on-demand. The explosion of data is a huge problem for organizations. Now, with GDPR-like regulations coming into place, company data is now also a massive compliance risk. DocAuthority enables you to turn these compliance requirements into business opportunities and use them to dramatically improve all aspects of unstructured data usage, management and governance. DocAuthority’s revolutionary and patented AI engine quickly and efficiently identifies and creates an inventory of all of your business data with the precision of 99.99%. With ease, you can now accurately identify both data’s risk and its value and automate its ongoing classification, protection and retention while improving accessibility and quality. Your privacy is important to us. It is DocAuthority’s policy to respect your privacy regarding any information we may collect from you across our website, https://docauthority.com, and other sites we own and operate. We only ask for personal information when we truly need it to provide a service to you. 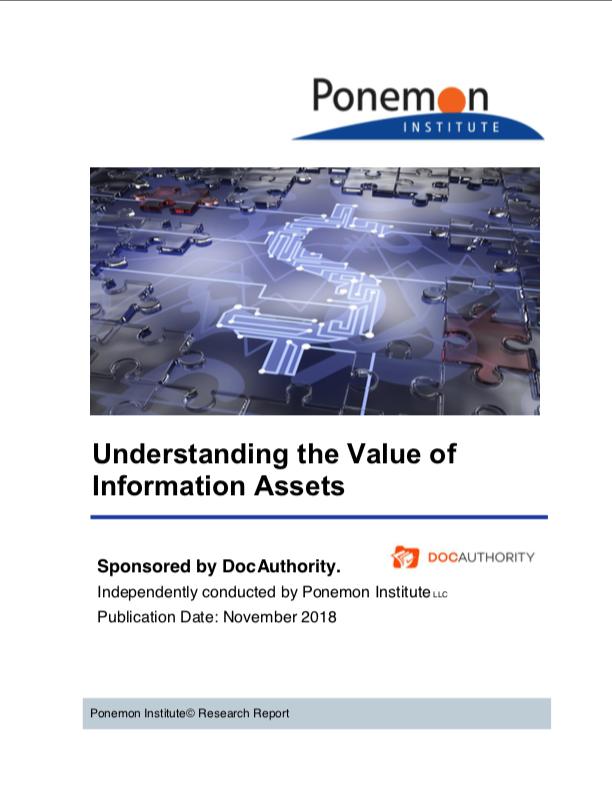 The purpose of this research, sponsored by DocAuthority, is to determine whether organizations are capable of estimating the true value of the information assets that are critical to the successful execution of their business objectives. Such valuation enables the prioritization of information assets that if lost or stolen would cause significant harm to an organization. To compile the report, we surveyed 2,827 professionals in the United States and United Kingdom who, as part of their job responsibility, are involved in managing high value information assets in their respective functions.